Various hues of BRG! Jim Campbell (Austin Healey 100/4, Paul Griffin (Connaught L2) & Harry Naerger (Jowett Jupiter). A Terrific sight! Putting any historic racing on in September is fraught with risk in terms of entry levels unless it is the Goodwood Revival or the Spa 6 hour meetings because they are where all the focus lies. Nevertheless, the gamble, initially at any rate, looked to pay off as FISCAR entries got into double figures and were to be augmented by some pre 66 cars. However, the withdrawal of a number entries, among them Alex Quattlebaum when the LECo failed on the rolling road the day before the event, dampened the spirits somewhat. However, 3 new very welcome entrants graced our grid - Philip Elder in his MGA, Ewen Sergison in Paul Lovett’s Connaught L2 & Harry Naerger in his Jowett Jupiter. Peter Bower substituted his Sprite for his Austin Healey 100/4 and though he qualified it well, it was not to be a good day for him. Qualifying was shared with the later sports cars of Race 7 but not only did Brian Arculus post the 4th quickest time overall, he did so well ahead of the pre 66 cars which were to join our grid. Paul Griffin, qualifying the Connaught ALSR 6th overall, was a superb effort and ensured that he would start alongside Brian on the front row of the grid. 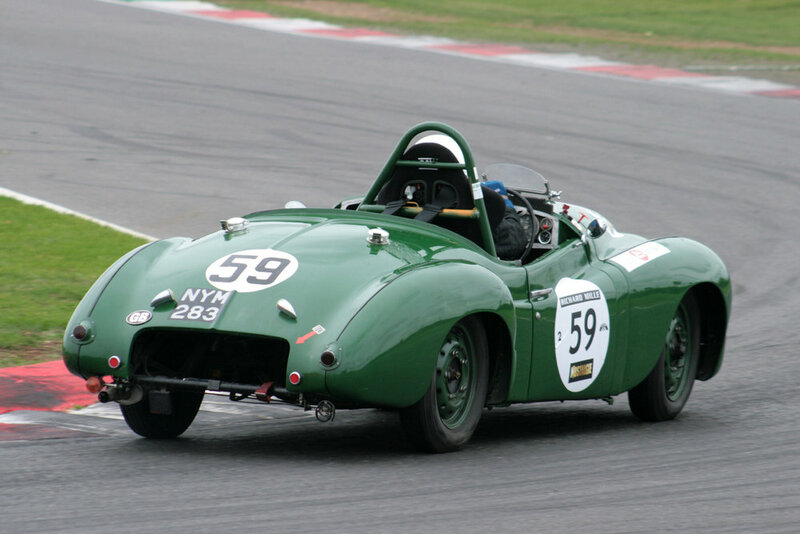 The rest of the FISCAR runners qualified in the following order - Peter Bower (A H 100/4), Jim Campbell (AH 100/4), Keith Hampson/Tristan Bradfield (Sunbeam Alpine Le Mans), Mark Morgan (AC Ace Bristol), Philip Elder (MGA), Ewen Sergison (Connaught L2) & Harry Naerger (Jowett Jupiter). 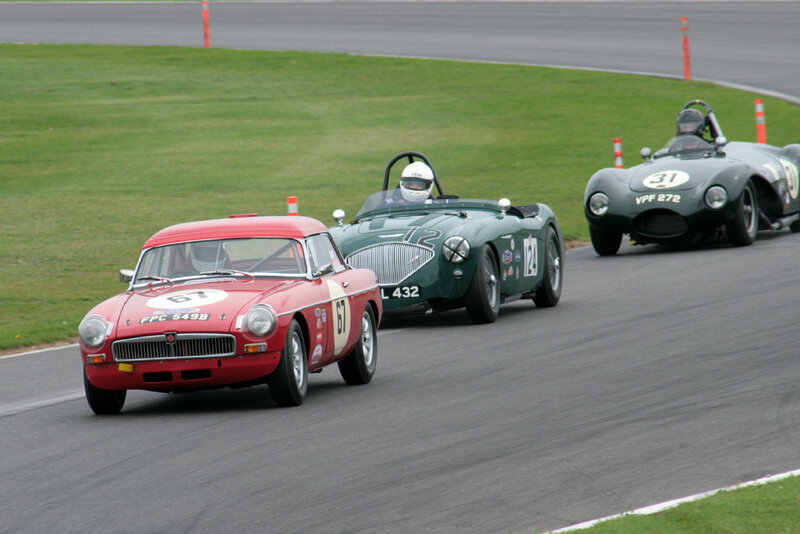 Interspersed amongst them on the grid would be two MGBs and a TR4, although in the event one of the MGs did not appear. The race was to be our usual 30 minutes witn a compulsory 45 second pit stop with the pre 66 cars having to take a 1 minute 15 second stop. A chill wind swept over the flat Snetterton circuit as the cars went out on their green flag lap to form up on the grid. 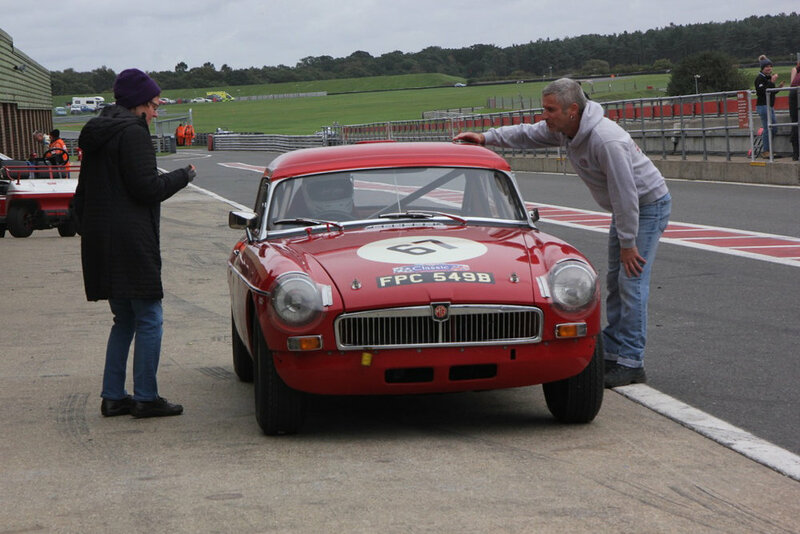 Stephen Bolderson’s MGB did not appear and Peter Bower’s Austin Healey 100/4 experienced distributor problems on the out lap and wasn’t able to take up his grid position. It was an issue that despite the best efforts of the dedicated James Littlewood, who looks after it, was to dog the car all day, although Peter was able to do a few laps of the later Archie Scott Brown race before retiring the car. Brian Arculus took the lead from the TR4 of Michael Hunter and began to draw away whilst Paul Griffin in the Connaught ALSR, who had been leapfrogged by both the TR4 and the MGB of Gordon Russell off the start, tried gamely to hang onto the latter with some success. Behind Jim Campbell, who also did not have the best of starts in his Austin Healey 100/4 temporarily found himself behind Keith Hampson’s Sunbeam Alpine Le Mans but stormed by the Sunbeam on the Senna Straight just before the end of the first lap and he immediately started to catch the MGB/Connaught battle ahead. Mark Morgan was next up in his AC Ace with Philip Elder holding onto him in the MGA. Unsurprisingly, given that they were the oldest cars in the race, and reflecting their qualifying times, the Connaught L2 and the Jowett Jupiter were also dropping behind but both made a splendid sight. 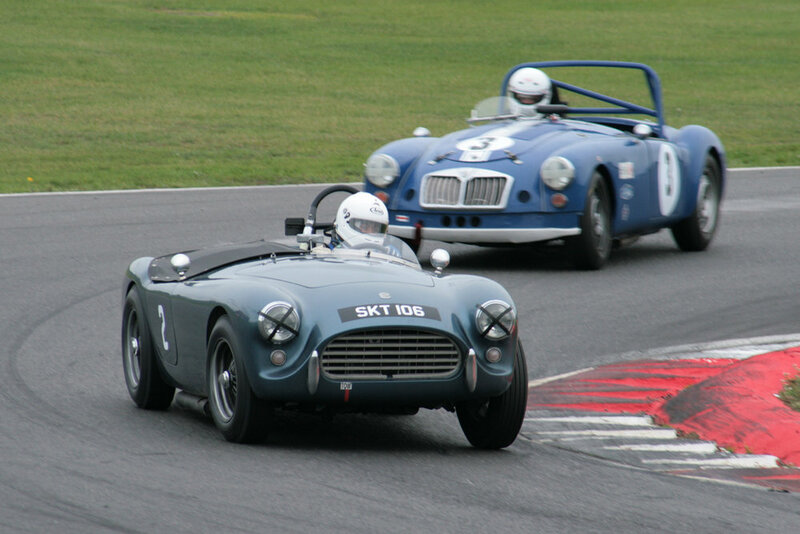 As Brian eased away from Michael Hunter’s TR4, completing lap 2 ahead by almost 4 seconds ahead, Jim Campbell cruised his Austin Healey up to the back of Paul Griffins Connaught, already in battle with the MGB of Gordon Russell and the two way dice became a 3 way one and at the end of lap 3 just over half a second covered the three cars in their battle for 3rd. The Sunbeam Alpine Le Mans was running a strong 6th albeit some way behind that battle but well ahead of the remaining cars which were becoming well spread out. The Connaught appeared to be quite a handful. Into Murray’s, Ewen Sergison puts a bit of correction in. Brian Arculus, comfortably in the lead, pitted for the compulsory pit stop at the end of Lap 4, which allowed Hunter’s TR4 into the lead. Jim Campbell had split the Connaught/MGB duel and the 3 cars were running close together. Behind these, the positions hadn't changed but the Mark Morgan (AC Ace) and Philip Elder (MGA) battle continued unabated with Mark having the edge. Behind the chasing cars were increasingly spread out. Brian Arculus pits the leading Lotus. Roy Gillingham who looks after the car, does the timimg - a compulsory 45 second stop as required by FISCAR pit stop regs. Paul Griffin (Connaught) and Gordon Russell (MGB) pitted on lap 5 but this broke their battle up as the more modern car had to stop 30 seconds longer than the Connaught, so, in F1 parlance, Paul was probably really racing Jim Campbell in the Austin Healey but Jim was to stay out longer and was one of the last to pit. Indeed, the pit stops were spread out, occurring on Lap 4 for Brian Arculus but lap 11 for the last, which was the Keith Hampson/Tristan Bradfield changeover in the Sunbeam Alpine Le Mans. It was to be several laps before the status quo was re-established. Brian took the Elite back into the lead when Michael Hunter brought the TR4 in for his stop on lap 10. 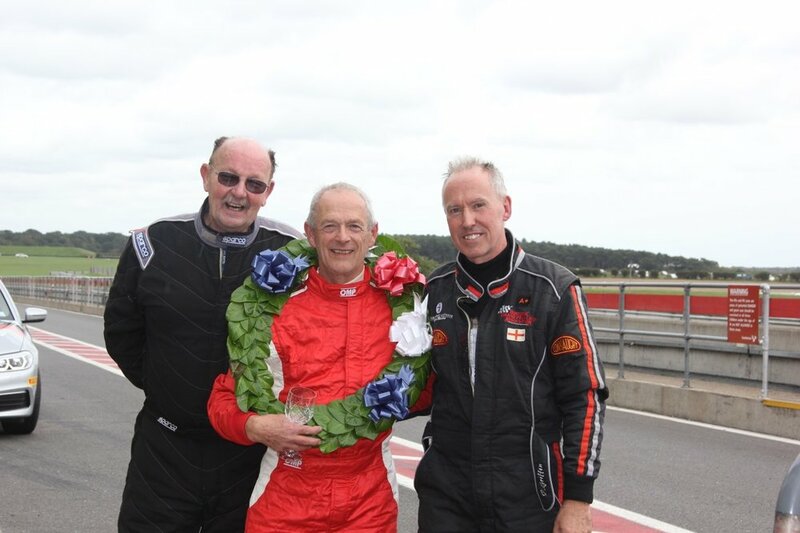 The Mark Morgan (AC Ace Bristol), Philip Elder (MGA) dice came to an end when Philip pitted on lap 6 whereas Mark waited until lap 9 before doing so. Michael Hunter assumed the lead in his TR4, once Brian Arculus had pitted and only lost it again to Brian once he too had pitted. Once all the pit stops had been completed, Brian’s lead in the Lotus was substantial as the longer stopping times of the TR4 and MGB had dropped them well back, suggesting that the 30 seconds added to their pitstops to bring about performance parity was perhaps more than required. By the end of lap 12, Jim Campbell had the Austin Healey into 2nd place, but Paul Griffin, bit between his teeth, was within a second of Jim and determined to get on terms. By the end of lap 14, he had the Connaught virtually alongside and we were being treated to a super dice. Jim just held Paul off but in his own words, ‘I was thoroughly enjoying the race with Paul until I simply out braked myself going into Wilson and ended up on the grass doing 360's before getting back onto the black stuff.‘ He attributed this error to ‘youthful exuberance’! The outcome was that he completed lap 17 just over 10 seconds behind in 3rd place which he was to hold to the end of the race well clear of Michael Hunter’s TR4 and Gordon Russell’s MGB, the latter lapping marginally quicker towards the end so that he completed the race just 2 seconds shy of Michael. 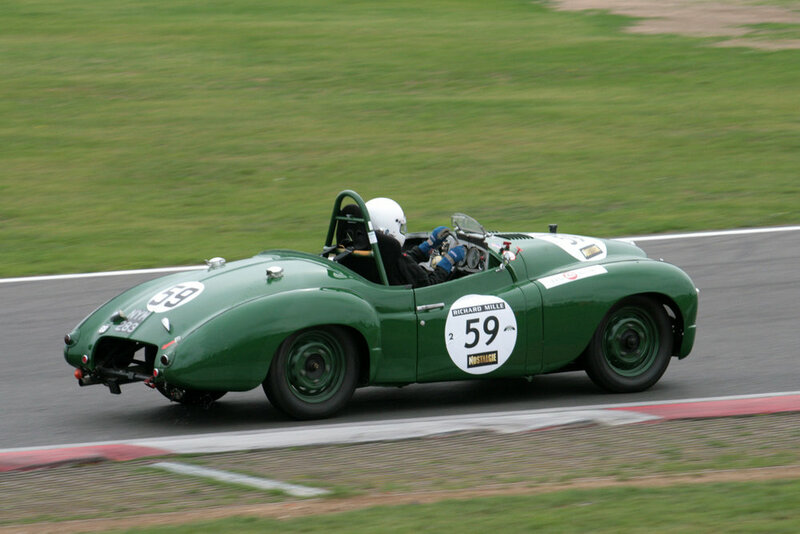 6th was Philip Elder in a good first drive with FISCAR in the MGA followed by the Sunbeam Alpine Le Mans of Keith Hampson & Tristan Bradfield with Mark Morgan in 8th place having dropped back a little once his battle with Philip Elder had ended with the pitstops. Ewen Sergison, with a lot of arm twirling, brought the Connaught home 9th but felt there was plenty of potential in the car once it was sorted. Harry Naergar and David Leopold in a rather lonely race was last of the classified finishers, but a great effort as first time out with us.